You’ve probably heard of the phrase ‘island time’ – mostly it pops up when Insta-addicted friends head to the Whitsundays for a weekend and want to show-off their strawberry daiquiri to those of us stuck at home. The real appreciation for ‘island time’ hits when you’re halfway across the world, sipping cocktails in the full knowledge that your coworkers are at an office desk (sorry guys). And here’s the truth of it – time’s actually moving as normal; it’s your self-induced food coma that slows everything to a snail’s pace. Despite all the fuss Tom Hanks made in Castaway, we were pretty content suffering through a few weeks on the beaches of Sri Lanka, leaving our timetable open for sessions of eating far too much, sleeping it off, and repeating as necessary until we started to wonder if our food babies would count as baggage weight on the way home. If you want to do the same, here’s where you should go. 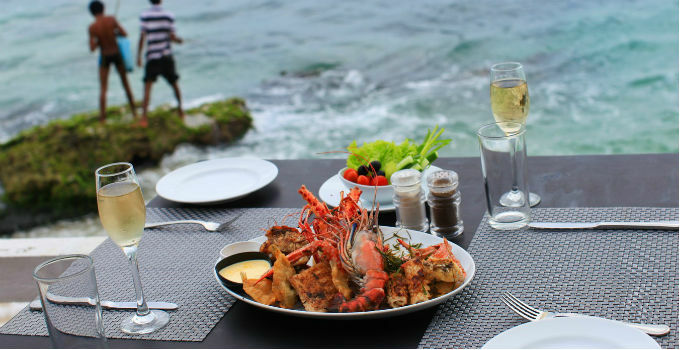 OK, we’re not denying the awesome scenery at the Jetwing Lighthouse, but not gonna lie – the things lighting up our life were plated up in the hotel’s Cinnamon Room restaurant, with plates topped by ocean fresh scallops, lobster and prawns. If you’ve got the time, make sure to check out the Rock Dining experience, where intimate groups dine under the stars right on the beach. Water lapping at our feet, a personal chef, and wine all night? We’ve found a new life goal. Gorgeous boutique hotel rooms set right on the ocean? Life’s a beach. Head to the Cantaloupe Aqua hotel for a quiet beachfront setting just outside Galle. Just a warning: sleeping in a king-sized bed overlooking the ocean will ruin bedtime in Brisbane for life (trust us, it’s worth it). Time to work up the next round of appetites! Take a walk around the famous Galle Fort, a 16th century building with plenty of photo ops. After upping your step count for the day, tour through the tastes of the Galle food markets – or head back to Cantaloupe Aqua for a cooking class with the restaurant’s head chef. There’s only one moment you’ll need to keep an eye on the time this holiday, and that’s to make sure you reach Zephyr at 6pm on the dot. When the time strikes 6, the beach restaurant (seriously – right on the sand) will lay out their catch of the day on ice for your selection. Sip cocktails as the sun sets, then experience another spectacle as the chefs arrive with lobster-sized prawns grilled in garlic butter sauce. Round off your food tour of Mirissa with the town’s best roti. While crowds will vouch for the No 1 Roti Shop (the name is pretty damning, after all), we’d argue that the roti from Amarasinghe Residences is bigger, better, and cheaper. Take a break from the crowds with a peaceful stay at Mirissa Bed & Breakfast. Along with gorgeous green gardens just a quick walk from the beach, this place earned our love with the fresh fruit platters for breakfast. Hunger was never really a danger during this holiday, but there’s not much sweeter than waking up to freshly-cut pineapple and watermelon. There’s plenty to do in this sleepy fishing village, with whale and dolphin watching tours leaving the harbor and tons of tour groups to join. Want to work off the mega-meals? Nab a tuk tuk trip to Weligama for some surfing or snorkeling. Set in a bungalow, the historic Gallery Café is popular for a reason – we recommend checking out the black pork curry or their assortment of sweet treats. Skip the beaches for a night and take in some history at the 19th century Residence hotel by Uga Escapes. The boutique spot boasts private courtyards and a gourmet restaurant. Those already in the throes of a food coma can rest it off by the pool. Hey, the sky’s the limit while you’re on holidays – add a night of extravagance at the Sky Lounge to your timetable. The post-modern rooftop bar boasts a massive cocktail list alongside champagne, cigars, and tons of tasty bites. Two words are about to become a part of your daily (hourly) vocabulary: egg hoppers. Forget the weird mental image and set aside a space in your mornings for an overabundance of these coconut milk crepe-like delicacies. With a fried egg set in the middle and plenty of curries to pair it with, breakfast will never look quite the same. Or better. If you’ve always wanted to live like royalty, even if it’s just for a little while, you can at The Kandy House. Built by a minister of the Kandyan royal court, this boutique hotel offers rooms with their own spa baths and an infinity pool to spend your days in. There’s one golden opportunity in Kandy that you won’t want to miss. Err, or can’t miss. With a golden Buddha towering high above the Golden Temple, there’s no chance of wandering past this sightseeing spot. You’ll have to climb a mountain of stairs to enjoy the famous cave temples, but with the amount of egg hoppers we were scoffing down on the daily, that might not be a bad thing. Trust us, the painted temples at the top are a sight worth exercising for – and we don’t say things like that lightly. On the way back to the hotel, stop by one of the town’s spice gardens for a peaceful roam through spices like cinnamon, turmeric, and cocoa.